Foreclosed homes in San Francisco are particularly appealing to buyers, especially since they can snap them up reasonably cheaply. Occupy the Auctions champions affected families by declaring a halt on home evictions and auctions and instead insisting the banks come up with a fair, affordable arrangement for financially strained families. 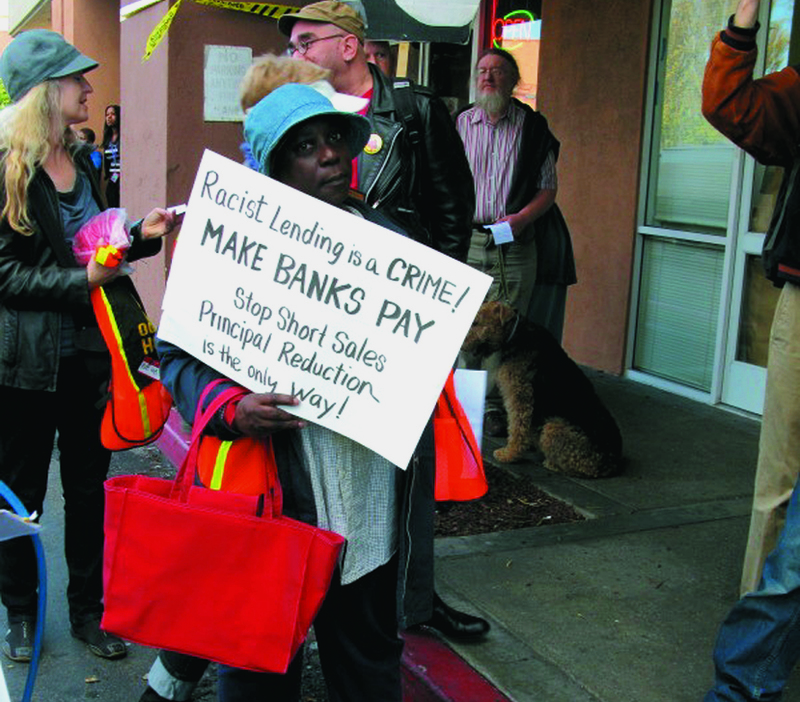 Editor’s note: This is the second in Street Spirit’s series on struggles to fight foreclosures. Last month, in the December issue, we reported on Occupy Our Homes in Atlanta. December 12 is a cold day in San Francisco, but the sidewalk in front of City Hall heats up as a confrontation breaks out between a prospective buyer and a man whose house is about to be auctioned right before his eyes. Bernal Heights resident Allen Stowers, born and raised in San Francisco, has become a victim of Wells Fargo’s predatory loan services. Stowers claims to have video evidence showing the “foreclosure vulture” unlawfully viewing his house earlier in the day. A sheriff steps in and the situation dissipates. “Wells Fargo assured me that they had canceled the foreclosure auction,” said Stowers. And after a long wait and numerous phone calls, the crier confirms that the auction is indeed canceled. Occupy the Auctions champions families and individuals by declaring a halt on home evictions and auctions and instead insisting the banks come up with a fair, affordable arrangement for financially strained families. Based in San Francisco, Occupy the Auctions comprises a number of local Occupy groups, and formed in the wake of the Occupy San Francisco movement, a citywide protest against social and economic inequality. Stowers is one of the “Wells 30,” a group of 30 San Francisco families Wells Fargo has put at risk of foreclosure or eviction during the holidays, all casualties of the bank’s rapacious lending culture. Unfortunately, his story is far from unique. Last July, the Department of Justice ordered Wells Fargo to cough up $175 million to compensate more than 30,000 minority borrowers who were allegedly guided into riskier, more expensive loans during the heyday of the housing market. Black and Latino borrowers were specifically targeted by the largest residential home mortgage lender, advised into higher rates and fees for home loans, regardless of the fact they qualified for better terms. Wells Fargo denied the claims of discrimination, yet nonetheless accepted a $125 million fine designed to compensate those the DOJ considered to have been unfavorably impacted by the bank’s unlawful lending culture. The remaining $50 million fine is due to cover homebuyer assistance programs in communities throughout the country that were hard hit by the 2007 housing crisis. The charges were based on a statistical survey of Wells Fargo’s home mortgage loans made between 2004 and 2009. Eight communities, including Chicago, Los Angles and the San Francisco Bay Area, are set to benefit from these fines. Occupy the Auctions works in tandem with the Alliance of Californians for Community Empowerment (ACCE), a nonprofit statewide community organization creating change by helping ordinary citizens to organize and take action against social, economic and racial injustice. Meetings take place at ACCE’s offices at 1717 17th Street, in which members plan protests, occupations and rallies. Numerous individuals and families have fallen foul to methods such as dual-tracking, where a bank continues foreclosure proceedings regardless of the fact that the homeowner is in the process of seeking a loan modification. Occupy the Auctions is made up primarily of foreclosure and eviction fighters, the people who are actively fighting to save their own homes, and home defenders, who assist the eviction fighters by offering support, protesting and helping to cut through the swaths of red tape surrounding a potential foreclosure sale. “What’s really exciting is to see an organization of the people that are affected taking power into their own hands and really doing the organizing to save their own homes,” said Martinez. San Francisco is among the most expensive cities to live within the United States. Foreclosed homes are therefore particularly appealing to buyers, especially since they can snap them up reasonably cheaply. However, because the properties often still have families living in them when they are bought at auction, it is the buyer’s responsibility to evict the ex-homeowner. The foreclosure and eviction process is often unclear to those at risk, as the information issued by the banks can be murky. 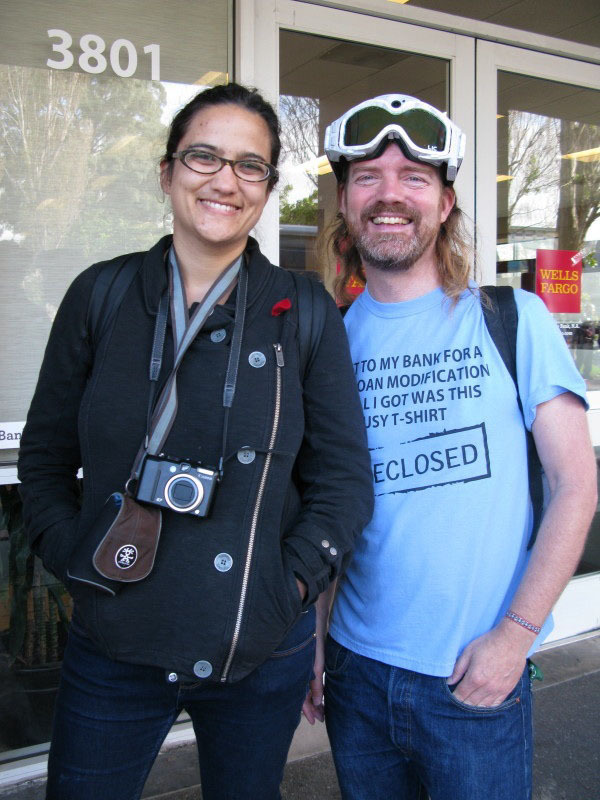 Occupy the Auctions activist Will Doherty (at right) takes part in many protests against foreclosure auctions in San Francisco, wearing his “extreme protest goggles,” a ski mask with an embedded camera to record any unlawful activity. On the flip side, the world is beginning to stand up and take notice of both Occupy the Auctions and ACCE. In July, the Homeowner Bill of Rights was signed into California law, protecting homeowners and borrowers during the foreclosure process. The bill bans a number of unfair banking practices that have forced countless families onto the streets since 2008. Dual-track foreclosures have been restricted. The bill also guarantees a single point of reference for the proprietor at their lender bank with knowledge of their loan and direct access to those that make the decisions. Civil penalties can now be imposed on fraudulently signed mortgage documents. Many success stories have followed, including that of Josephine Tolbert. Last year, the 76-year-old San Franciscan found the Bank of America had sold her home to an investor while she was negotiating a modification on her loan (dual-tracking). Occupy the Auctions, ACCE, and the local community acted on this and a large group attempted to re-occupy her house, only to find an overwhelming police presence preventing them from doing so. Unfazed, the group stormed the offices of the investor to make a stand. The pressure paid dividends and the investor relented by selling Tolbert’s property back to the bank which eventually renegotiated her mortgage payments. Each individual foreclosure case is unique. There have been instances where banks have offered fair loan modifications to those who have been unable to make their payments. However, when this is not the case, Occupy the Auctions have devised what they call a “staircase model” — a set of actions that can be implemented in an attempt to persuade the bank to offer any particular debtor affordable payment terms on their mortgage, as demonstrated in Tolbert’s case. “If the banks refuse to negotiate, we then organize protests at branches, followed by protests at HQs, followed by protests at the homes of bank executives and, of course, protests at the auctions,” said Will Doherty, aka Stardust, a passionate activist and one of the most prominent figures rallying the Occupy the Auctions movement. Doherty can regularly be seen protesting against foreclosure auctions on the steps of City Hall sporting his “extreme protest goggles,” a ski mask with an embedded camera to record any unlawful activity. As a Bernal Heights resident, he fights for members of his own community and was one of the founding members of Occupy Bernal, “an autonomous neighborhood group that defines it own activities.” Bernal was the first neighborhood in San Francisco to form its own Occupy group back in 2011. Stardust is also responsible for the website, www.occupytheauction.org. The website documents the dates and times of all foreclosure auctions so that protests can be coordinated. He also has conducted and posted detailed research outlining the individuals, corporations and consortiums of investors who regularly purchase foreclosed properties in San Francisco. San Francisco isn’t the only city in which foreclosure opposition is making strides. Gayla Newsome of West Oakland has been a direct beneficiary of the Occupy influence. During July of 2011, her three daughters were evicted from her home while she was at work. After what turned out to be an unlawful foreclosure, Gayla and her family joined ACCE and started to cooperate with Occupy Oakland to kick-start a recovery of her property. A huge crowd of nonviolent ACCE and Occupy activists helped Galya rightfully reclaim her home and after she refused to relocate, Residential Capital Mortgage deeded her house back to her. Eventually JP Morgan Chase approved her for a trial modification. Yet another victory for the Occupy movement. Oakland has seen many properties sold at auction, but unlike San Francisco, where homes tend to be sold off one by one, whole blocks of foreclosed apartments have been purchased by investors due to cheaper rates. If you are currently experiencing a foreclosure sale, or want to become a home defender, or are keen to protest against foreclosure auctions, visit www.occuuptheauctions.org. 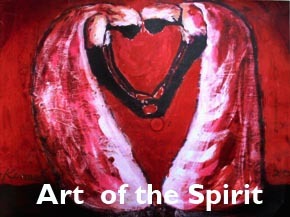 The art of homeless artists, reviews of gallery showings, profiles of artists and more.